Be sure to make plenty because you’re going to want enough for leftovers. 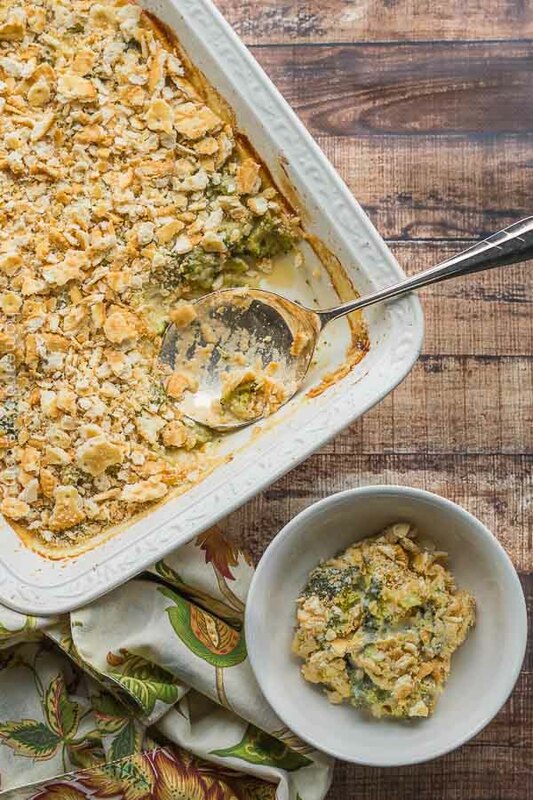 This easy side dish is the ideal companion to roasted turkey, pot roast and holiday ham. 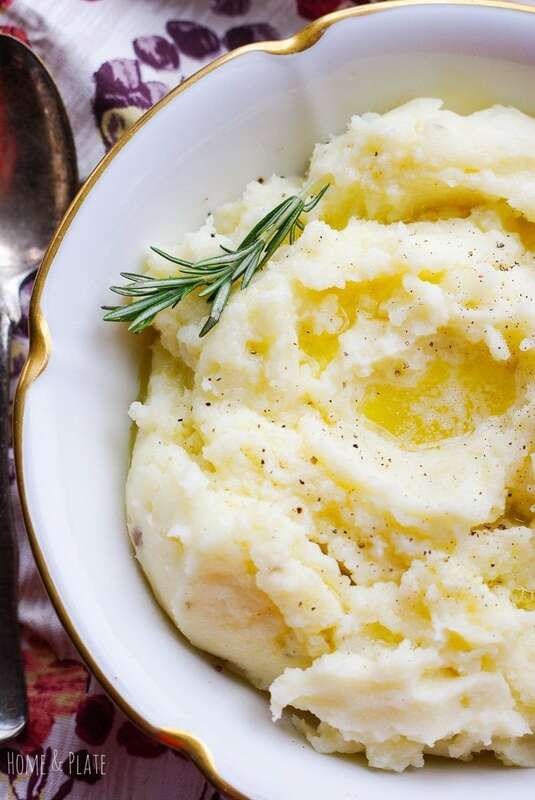 At our house, mashed potatoes are the star of the show every Thanksgiving and Christmas. Like me, I’m sure you’re busy in the kitchen preparing everything else that must go on holiday table. That’s why I will whip up a pot of mashed potatoes days ahead and finish them off just before the big dinner. That way I eliminate the mess, mashing at the last minute and the cleanup. Plus I maintain my sanity. The trick is holding off on the butter until you are ready to serve. Once you are ready to serve it’s time for the creamiest potatoes. Melt the butter first. Place the refrigerated potatoes in a pot on the stove or pull out the crockpot. Reheat slowly adding the butter as you go. Stick with Russet or Yukon Gold potatoes. 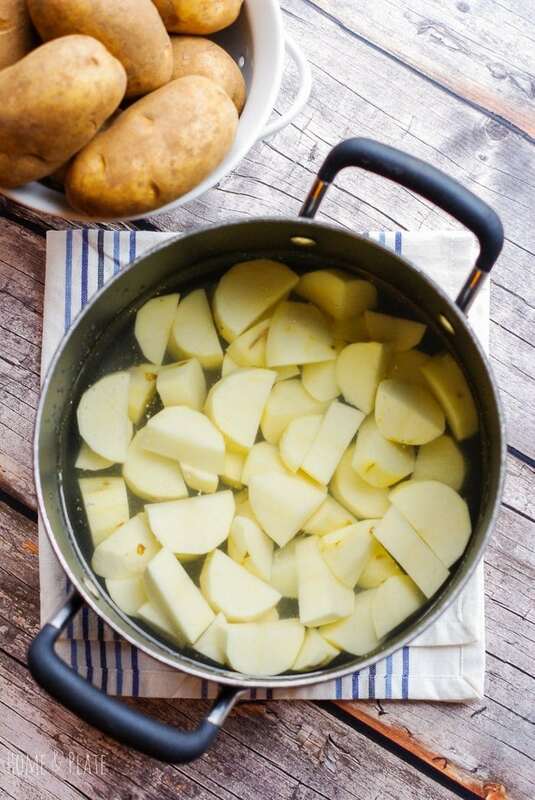 Place your potatoes in cold salted water then bring to a boil. Never leave your boiled potatoes in the water. Drain them immediately. 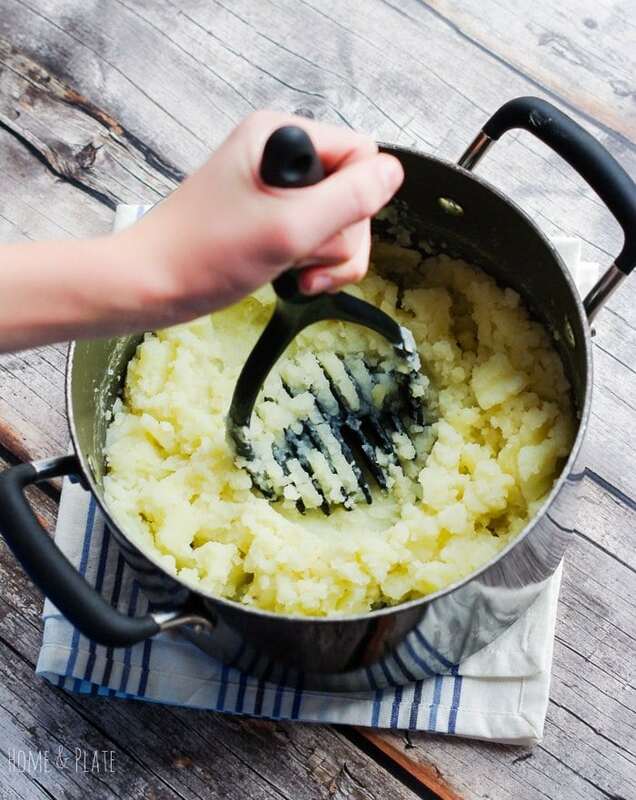 Use a potato ricer or masher and don’t over mash. The more fat in your milk or cream, the creamier your potatoes will be. Warm your milk and butter before adding to your mashed potatoes. 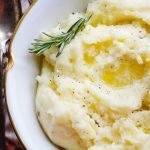 WANT TO TRY THESE MAKE-AHEAD MASHED POTATOES? Peel, rinse and chop the potatoes into small chunks. Fill a large sauce pan with cold water and season generously with kosher salt. Place the potatoes in the pot and bring to a boil. Reduce heat and simmer until tender when pierced with a fork, about 20 minutes. Drain the potatoes in a colander then return to the pot. Add the milk before mashing the potatoes with a masher. Transfer the potatoes to an airtight container and refrigerate for up to 2 days. Before serving, return the potatoes to a pot over medium heat or crockpot on low and add the melted butter. Leaving the boiled potatoes in the water will result in gummy potatoes. Allow the potatoes to drain for a few minutes before returning to the pot. Do not overmash the potatoes. Using a mixer results in gooey potatoes. Stick to a potato masher or ricer to create the creamiest potatoes. This is such a great timesaving tip. 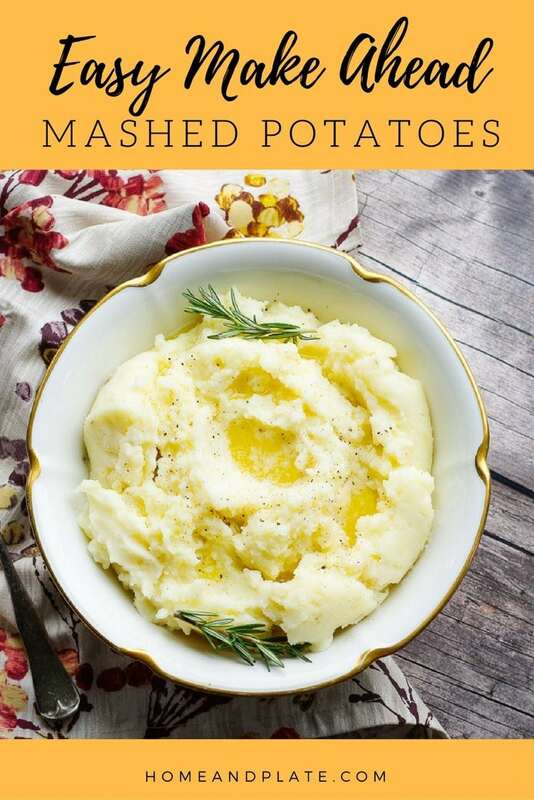 I’ve only ever made mashed potato when I’m ready to eat it – but great to know holding off the butter until you’re ready to serve them means you can cook the potatoes ahead! I love when you can make any part of dinner ahead of time! What a time saver! I never thought of making the mashed potatoes ahead. That will free up my stove for other pots! Anyway you can free up space in the kitchen I’m off for. 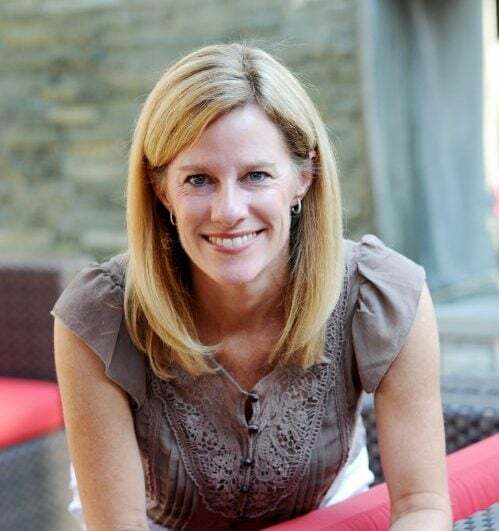 Thanks Leslie. Love that I can save space and not skip on flavor this holiday season. I agree holiday time is for our family not for cooking recipes through out day. love this recipe.